It’s been a couple of weeks since my last blog post. There really hasn’t been much sewing going on around here, so I haven’t had much to share. Part of the reason I haven’t been sewing is that I’ve been teaching retreats the last couple weekends. That always involved several days of packing, plus 6 days of teaching, so it really cuts into my productivity! The other reasons that I haven’t been sewing much is that I’ve been busy feeling sorry for myself. Because this is what my living room looks like. Yes, those are open rafters up there and that is insulation and dust all over the floor. My pretty little kitchen is in shambles and my living room looks like a construction zone. You may remember me saying that I was never remodeling again. We’ve done that a few times in the this house already, and we thought we were done. Done for several reason – we are a totally burnt out from being a little too handy, we want to stay sane, therapy gets expensive, and best of all, the house was finished. So, with all that being said, why is my main living area in shambles? Apparently the snow load last winter was a little much for our rafters. We didn’t realize how much snow was up there until we started shoveling it off. It took my DH and BIL all day to shovel it, plus I helped for a few hours until I couldn’t hold my arms up anymore. We were tempted to haul the snowblower up on the roof! Seriously, that does happen, but maybe only in Minnesota! We didn’t realize that it was an issue until this past spring. Several of the joints in our NEW ceiling cracked. We had never had that much movement in our house before and we thought it was a little strange. 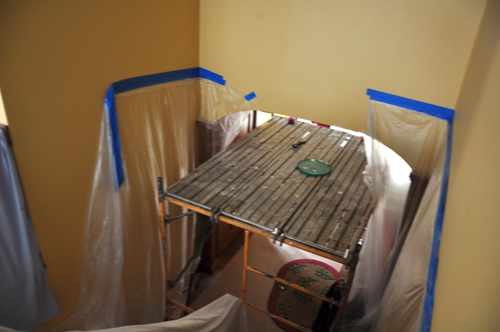 Then one weekend a couple of months ago, our ceiling started leaking into the kitchen. That’s when we knew something was really wrong! After a little rummaging around in the attic it was discovered that one rafter had a slight crack and two other rafters had bowed. That caused the ceiling to crack and the flashing to pop loose around our chimney, which caused the leak. and my front entry looks like this. Charming, isn’t it? It’s been quite a process. 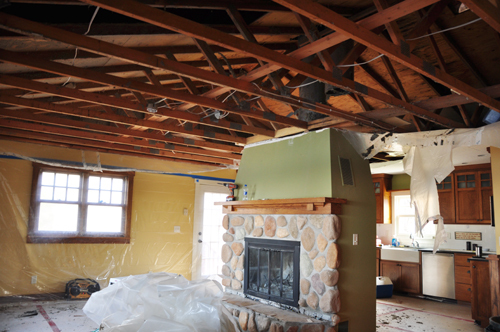 The ceiling and insulation have all been taken down. The rafters have been fixed and “beefed up”, whatever that exactly means. New sheetrock has been hung. But, while we were at it (I know you have heard me say this before), Joel decided to rip out the old wood burning fireplace. Really, I had nothing to do with it. It’s all him. I did not put him up to this. He decided, that even though our house is surrounded by woods, he doesn’t like cutting up trees. I’m not much help, because you can’t cut down many trees if you don’t even know how to start the chain saw. (That might be intentional on my part, but don’t tell anybody). 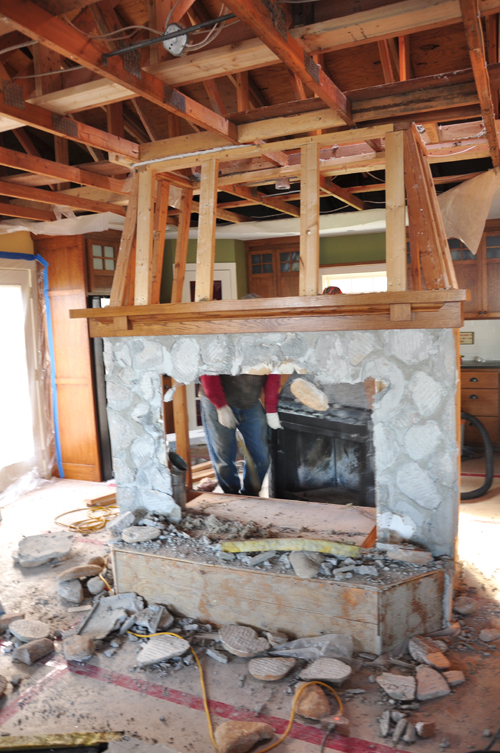 It was a big job taking that beast out, but I have to say that I am really excited about that new gas fireplace. Having extra heat at the touch of a switch might be just the ticket to make these MN winters more bearable. It might even make this whole drama a little more worth it. The situation is improving though. This is how the house looked yesterday. The walls and ceiling have been taped and textured. The insulation is back in place, meaning the temperature in the house is much warmer (we’ve had a few nights below 30, so it’s been a been nippy). Today the ceiling and walls are being painted. The fireplace is being installed tonight. Guess what I’ll be doing? Cleaning up this mess! I don’t ever think I have been so excited to clean in my entire life. I can’t wait! I will have to set my therapy aside . . . . 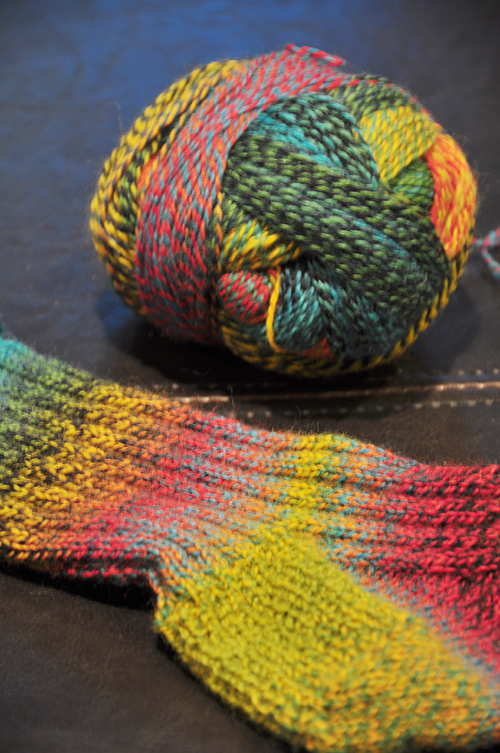 I probably would have never learned what a Zuberball was or how to knit socks if it weren’t for this mess. So, things are looking up around here. I will eventually stop complaining and feeling sorry for myself. I mean after I can start using my kitchen again. In the meantime, if you want to feel a little sorry for us, it might help just a little. This entry was posted in Decorating, Minnesota. Bookmark the permalink. 42 Responses to What a Mess! You poor thing! What a mess. And I sometimes think I would like some snow–maybe not. Oooohhhh. I’ve lived through messes like this and I do feel sorry for you. Do you feel better now? It’s going to be beautiful when you finish!!! I feel so sorry about your home. Had a flooded basement myself but nothing like that. It’s a huge job to clean it up. Just think. New paint, fireplace etc. It’s going to look great. Did you change the paint color? Oh, I do feel sorry for you! That was a mess, but it’s looking good now! I know about not learning how to do something. I can’t fill my car with gas-just never learned. And I don’t intend to either! Oh, honey!!!!! 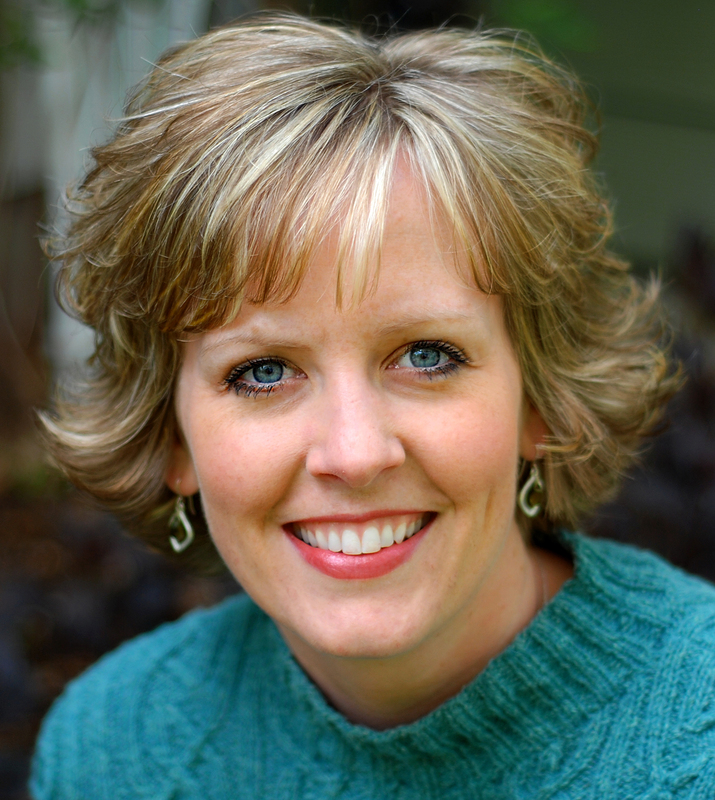 Thank goodness for retreats! And the sock…a really bright one at that! I’ll feel really sorry for you. Yuck! Its nice to remodel if its your idea, but not if you’re forced to. Wow…you will be happy when this is all cleaned up…I’ve never heard of anyone having to do that before…but then again we just don’t get snow here in southern Nevada! Don’t you just love renovations? 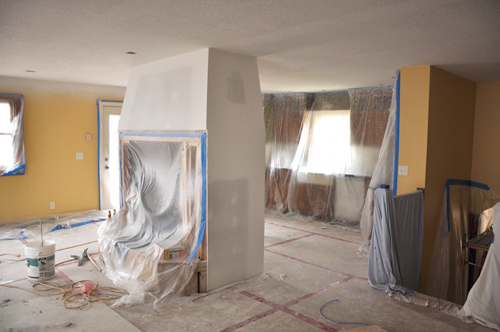 I’m sure the end results will be worth all the mess and I’m absolutely sure you will love your gas fireplace! Remodeling is not fun! BTW, you are going to love your gas fireplace. We put one in our great room addition, a room that’s 24 x 26, and it heats the room no problem. We have a woodstove in the other part of the house but the gas fireplace is so much better. It will be worth all the work, of course when it is done! OMG! It’s terrible!!! I would have been totally depressed if this had happened to me! Believe me, I feel very sorry for you, but just think that it will be very nice when it’s finished. Hugs! Wow – but it’ll all be worth it when it’s done and you’re nice and toasty this winter and you’ll know that your rafters are secure and no leaks! Nice to have a handy husband! Hopefully you’re past the worst of the forced mess! It will be nice for you to get it all back to working order and enjoy not having to rely on wood to keep you warm. I had my kitchen re done this year. It was supposed to take 3 days! SIX WEEKS later it was finished. So I know how unsettling it can feel to have the heart of your home in bits. I hope it’s all fixed up for you soon. Oh my gosh! Definitely feeling sorry for you over here. That looks like quite the mess. It will be gorgeous though when you are done, no doubt about that. I’ve missed you lately. We need to catch up one of these days! EEEEE-Gads! I know exactly what you are going through! 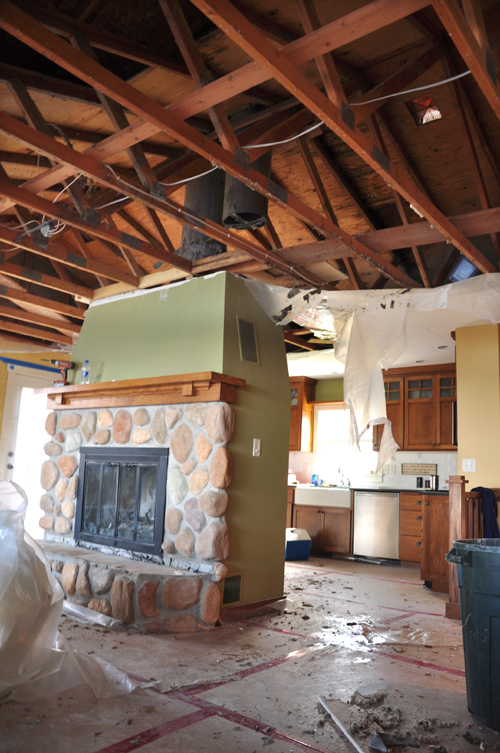 Having been through many remodels and also a house fire… it’s not FUN!!! A very stressful time to say the least! Sounds like it is moving along swiftly now though, I’m glad for you! When we had our fire, we did’nt replace the wood burning fireplace with wood either…GAS is the way to go! I absolutely love it, and I am sure you will too! Can’t wait to see your color choices! Eeks.. where did you put all your furniture??? Best of luck to you! It will be done soon! I was just glancing thru the blogs on my reader and was feeling really sorry for whoever this was……and then I got to JOEL!……OMG……it’s YOUR house! 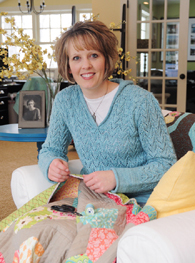 All those beautiful quilts and fabrics and drywall dust all over….Oh man. This was the last thing you guys needed, huh? I’m glad it’s at least this far along now. 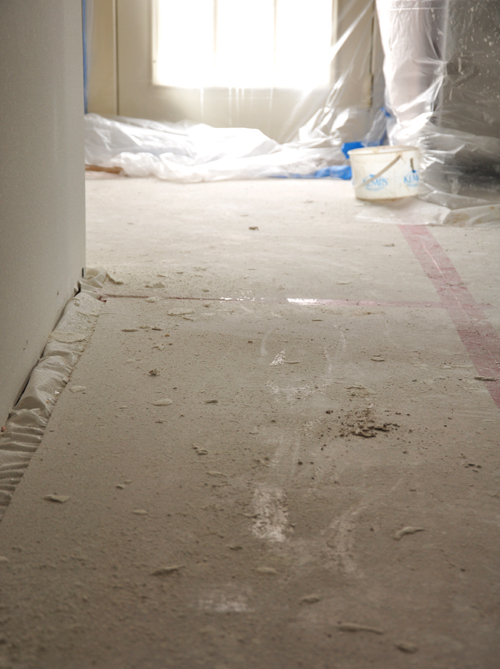 Water damage issues are never neat and clean! Glad you found this out before the temps are 30 below instead of 30 above. I’m sure it will look as pretty as ever once the Mess is gone! It is such an unsettling feeling to be ripped apart… goes against the grain of those of us that are obsessive-compulsive (of which i am one!) It will be beautiful when it is all finished and soooo nice for the holidays. Have a wonderful Thanksgiving!! I feel your pain; we are still in the midst of a long and drawn out “small” repair job (from water leaking from the ceiling) that ended up to be a lot more than that. Having some difficulty communicating with the carpenters how we want things done. Seems like 2 steps back and 1 forward. sigh. The joys of remodeling; and I’m having Thanksgiving at my house! I’m sure all will NOT be done in time. At least you’re making great progress!! I’m so glad you are to the part where things are improving Heather. Hang in there! Oh my gosh… I would feel sorry for myself as well! It looks like you have made huge progress. Good thing you realized the problems before this winter. You will love the gas logs! The new living room and kitchen will look terrific after you put the finishing touches on them! Awwww, you poor thing! I don’t blame you for feeling sorry for yourself. At least you’re getting this done before the below 0 temps. start coming. You will feel better about the whole house once it is all strong again. I do feel so sorry for you. It’s one thing when you choose to do the work, but when it chooses you? Oh man, but I know you will have it looking lovely in no time. You are so very talented! When I saw the first picture I wondered why you couldn’t just be happy with your beautiful home. Then I read on!! I bet your will be totally thrilled with the changeover in the fire place. And you know how you like to redecorate. So… much brighter days ahead. And good excuse to go to someone else’s house for Thanksgiving…and Christmas?? Oh heavens, I can’t imagine living with the mess! 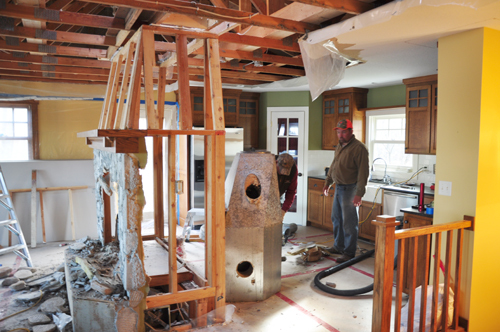 Just redecorating is a pain – can’t imagine a remodel. But….sure would love to replace the old fireplace with a gas one. We live in southern Louisiana, so a gas fireplace would be the trick – just enough to take the chill out of the air when needed. Enjoy it!! I can not believe how quickly you and your husband get things accomplished. What takes most of us months, you guys have it done in days! This is going to be SOOOOO nice when it is finished, and you will have the coziest of winters in your new little abode! Can’t wait to see the finished look! I do feel for you. A few years ago when we remodeled our kitchen, I was cooking on a camp stove in the garage. We did the dishes in the sink in the bathroom. We, too, converted our woodburning fireplace to gas a few years ago. I did like the wood heat, but those gas logs aren’t nearly as messy as carrying in the wood logs. Your home always looks so lovely, so I know it will be just wonderful when you get finished. Can’t believe no one has asked you about the Zauberball yarn! I googled it and have fallen in love with it, and must have some. Do you have a local yarn shop or buy online? BTW just wanted to thank you again for the fabric in the Fall Blog Hop giveaway box. I washed and pressed it all yesterday and I can’t wait to sew up something special. The fabrics are scrumptious! Oh man, I feel your pain – look on the bright side, though – definitely a very good excuse to hold Thanksgiving at someone else’s house 🙂 I hope you used this opportunity to paint your living room a different color – I mean, as long as you’re painting anyhow, might as well change things up, right? That of course leads to my favorite therapy (after knitting), which is shopping. A little retail therapy never hurt anyone and new paint is a great excuse to go look for new accessories, or a new couch, or a new whatever. Have fun – it’ll be great when it’s finished! Oh, wow, Heather. I do feel sorry for you and I would probably feel sorry for myself for weeks!! lol I’m wishing you a speedy resolution. Oh my, oh my . . . So glad you have knitting therapy, and can look forward to being really warm very soon! Oh, wow, Heather! That is quite the house drama. I don’t know how on earth you are living thru this. But you do have pretty rafters! 🙂 can’t wait to see it completed and put back together. Is it coming along now? I bet it will look great when you are done. You are so lucky your husband is so handy. Your sock has wonderful colors. That yarn knits up beautifully! Oh my! I do hope all goes smoothly and quickly from here on out. Sending my sympathies and best wishes. Oh, Heather, I’m sorry I didn’t check in sooner, well I did but you were still away – not that I could have done anything, but send positive vibes. I remember you thinking you had finished all remodeling for a while, and your home was so lovely. I’m sure with this problem tho you will have wonderful improvements – just not a great time to have to do this. I hope you enjoy the day off and have a blessed Thanksgiving.